Caught on film – evidence of music therapy stimulating memory and social interation, while reducing behavioral, cognitive, and emotional problems. 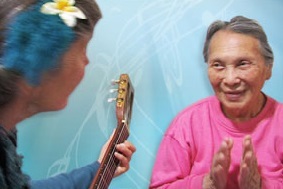 This program documents the power of music to transcend the challenges of dementia as it shows non-responsive, non-verbal residents suddenly smiling, singing, moving, and interacting with others when engaged through music. These before-and-after glimpses of residents “reconnecting” encourage the use of music therapy as a method to boost quality of life for residents. The DVD also touches on the concept of neuroplasticity, which describes the ability of the brain to change its own structure and function through thought and activity, as well as, the palliative effect of music. Based on the work of registerd music therapist, Alkeiya Brown, who has extensive experience working in the arts with all ages from the very young to very old. Chaptered into two parts for easy access to specific clips of interest.